A vote for me, will be for the future. Our people are suffering. We are living in poor conditions because we continue to be robbed, because our economy from the cradle to the grave is controlled by others. There are poisons in our community. The poisons include meth, heroin, opiates, prescription drugs… those poisons include the chemicals and pesticides seeping into our water from agricultural run off and the mercury in our lakes from the coal plants. Stop the poison and those who make a living off our misery. Challenge polluters and drug dealers. We are self medicating because of our historic and present trauma. We hurt each other, and we are victims. Our people have been criminalized, fill the jails and are treated as second class citizens- still today… The reservation to prison pipeline needs to end. Decriminalize our people. Treat our addictions, heal our people. I have worked with our tribal members and others to defend our land from genetically engineered wild rice and oil pipelines and to honor the 1855 treaty. Our treaty rights are threatened. Time to stand with our ancestors. Time to say no to oil companies. And at the present enrollment of l8,000 people, some l,400 are under l8-yrs. This means that we will lose many members if we do not change how we count our people. Let us solve this together. All of us. There are a number of good people running for this office. The time is now to quit talking badly about each other. That’s how we stay oppressed. Let us put our minds together. Because together we can make a change. I received my education from Harvard, and the Massachusetts Institute of Technology. I have a Master’s degree in Rural Development. I have worked for 35 years on the White Earth reservation. Many times the tribal government has thrown up obstacles. This makes no sense-because working together to get food to your people, to cut their heating and electric bills and to keep pollution out of our groundwater, is best done together. If elected, I will work to support my people … and all who work together. Why is it that if I want clean water I am called an activist, and a corporation that poisons our water is not called a terrorist? I have worked hard on the environment, on food, on energy and for our families. Anishinaabe Akiing fought the White Earth Land Settlement Act. The White Earth Land Recovery Project is what I led for 25 years and bought back 1400 acres held by a land trust on the reservation-lands open to tribal members. Native Harvest sells maple syrup, wild rice from the reservation. I worked with others to create Niijii Radio, the only independent tribal radio station in Minnesota. I have worked with our tribal members and others to defend our land from genetically engineered wild rice and oil pipelines and to honor the 1855 treaty. I have testified at Congress and the Minnesota Legislature, and United Nations, and I can write laws and regulations. I can work with people. We need a state-of-the-art treatment center on reservation, which includes traditional Native medicines and spirituality. We need a healthy community. We can build a strong tribal economy from the reservation to the city and beyond where our people are working. Right now we spend about half of tribal money on food and energy, and we do not own any of it. We need to produce our own food, energy, housing. We need our own economy from cradle to the grave. We need jobs in our communities-production, manufacturing and service. Hemp is a $5 billion economy, and we can work together to make a hemp economy. I support tribal regulated medical marijuana, and a manufacturing economy with solar, and quality jobs . Solar energy jobs have doubled in the past five years, and are the future. I support tribal people owning our businesses as cooperatives, and as individuals. I support tribal regulations and jurisdiction; from taxation to infrastructure regulations. Those are for our nation to regulate. I want to serve my people. That is what I want. I am a grandmother, Makwa Dodaem. I have raised six children, and I have eight who call me grandmother. I am here for them. That is who I am. We need leaders who have courage, integrity, and are hard working. We need leaders that will fight for what is right. We need leaders who can bring food to the table, will roll up sleeves and chop wood, or work hard to make change, not sit behind a desk and watch it happen. We need leaders who raise the next generation- and work to make a future for them that is clean, their minds and bodies not contaminated, and on the land their ancestors fought for. 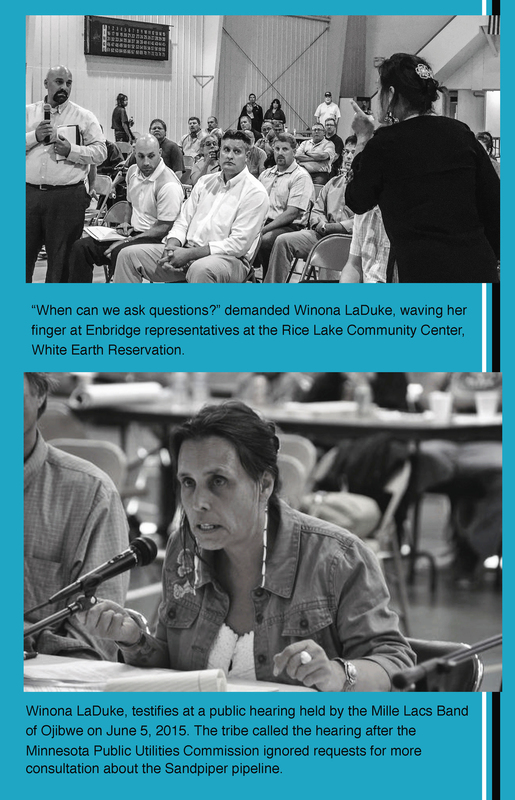 Vote for Winona LaDuke, that is a vote for the future.